Where Will Senate Debate on Immigration End? - Integration Through Media ....! Where Will Senate Debate on Immigration End? (VOA): The U.S. Senate is set to begin an unusual debate on immigration Monday. The debate is unusual because it will begin with a blank slate instead of an actual piece of legislation. Senate Majority Leader Mitch McConnell has said he will open discussion with a shell bill that has no immigration provisions in it. Lawmakers will then propose amendments or provisions that will fill up the shell. The Kentucky Republican has said the amendment process "will ensure a level playing field at the outset." 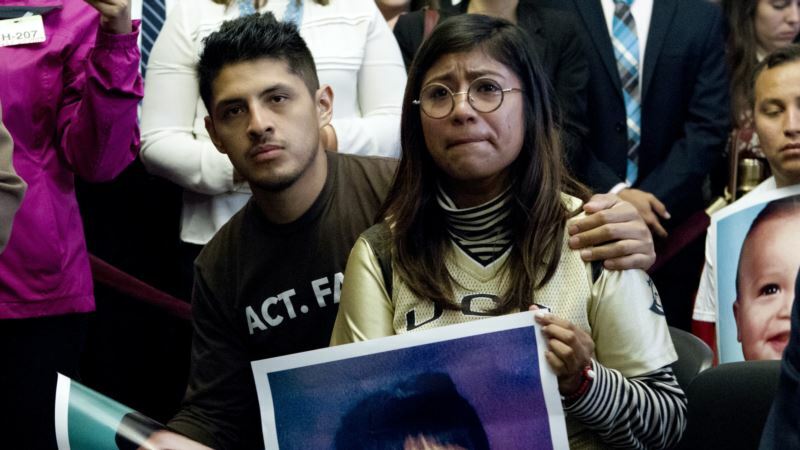 Lawmakers are expected to discuss the fate of immigrant youths now benefiting from the Deferred Action for Childhood Arrivals (DACA) program, which was implemented during the Obama administration. It has allowed young people who were brought into the country illegally as children to gain temporary protection from deportation and permission to work. Its beneficiaries are often referred to as Dreamers, a name taken from a legislative effort that would have provided similar protections but was not passed. President Donald Trump rescinded the program last September but gave Congress until March 5 to come up with a legislative replacement. Senators on Monday are also expected to discuss a proposed border wall, the diversity visa lottery, family sponsorship visas and just about anything else that comes under the heading of immigration reform. No 'permanent fix' seen So what legislation will come of all this? Not much, said Alex Nowrasteh, a researcher with the libertarian Cato Institute. Nowrasteh told VOA he did not see a "permanent fix" coming out of Senate after next week's debate. "At best, we can hope for a bridge bill, a bill that delays or allows some DACA recipients to extend it for a short period of time in exchange for border security," he said. Sarah Pierce, a policy analyst with the Migration Policy Institute, has an even darker view. "As much as my gut is telling me that an ultimate bill could have just border security and a DREAM Act component," she told VOA, "the White House is really going to be the final determinant in whether or not such bill could go through." And President Donald Trump has said that no bill will meet his approval unless it contains his "four pillars": funding for the border wall, the end of the diversity visa lottery, a switch from family-based immigration to merit-based immigration and a solution for DACA recipients. McConnell's decision to have a shell bill on the floor was not made because Congress lacks other options. Republicans have introduced several bills to try to resolve the immigration impasse, among them the Senate's RAISE Act and the House's Secure America's Future Act — both of which call for comprehensive immigration reform and have Trump's support. Nowrasteh said no proposed legislation has a chance of getting the 60 votes needed to pass. He said another bill, the United and Securing America Act introduced in the House, is a "much more modern" approach to immigration. This narrow bill would give DACA recipients a chance to apply for permanent residency in the U.S. while also increasing funds for border security. A companion bill was introduced Tuesday in the Senate — and almost instantly was rejected by Trump. But Nowrasteh was no more optimistic about these bills: "There's not going to be a bill that's passed that resolves this issue." 'Really interesting' week Debate begins a week before the Senate's February recess and just a few weeks before March 5, when DACA recipients' protection will begin to phase out. It is going to be a "really interesting" week," Pierce said, noting that the senators' amendments could have serious consequences for many people. And while almost 700,000 undocumented young people are protected by DACA, many others aren't. "The Migration Policy Institute has estimated that there are 3.6 million individuals who are in the United States, who are unauthorized, who were brought back here under the age of 18," Pierce said. So, any bill, according to Pierce, is going to be addressing a subgroup of that population. Other factors that concern her are what kinds of benefits might be extended to the young undocumented population. "Will it be a path to legal status and citizenship or will it simply be an extension of this temporary nonlegal status that they currently hold? … So, in one week of debate, are they really going to be able to solve that issue? I think that's very much an open question," Pierce said.